Welcome back to Nightmare on VPN street with TMG and SSTP – Part 2 of 4. If you’ve been following along, we’re going to configure the TMG server to request a new certificate from the internal CA. If you want to go back to Part 1, click here. So here’s my take and process on this issue. Once your certificate expires on TMG, you’re basically hosed as the replacement process appears to be manual. If you change out the certificate in the web listener, that’s a good start – but will not work if you don’t do other things. 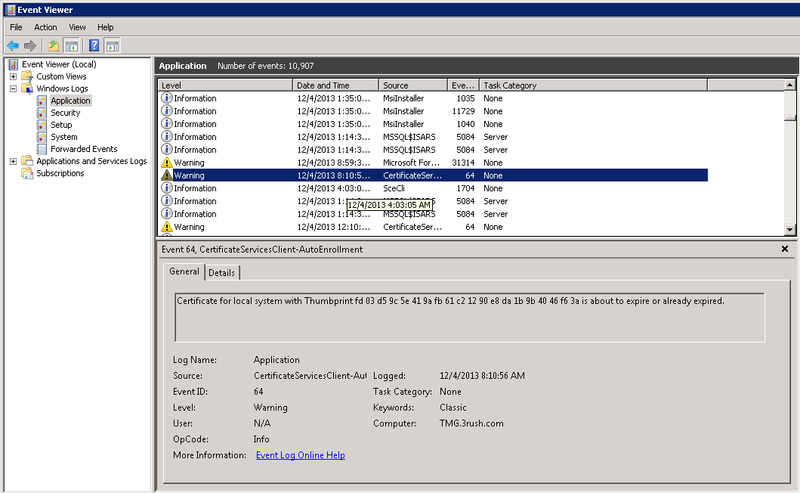 TMG will not properly remove your old certificate from the registry and will not properly register the new certificate into the registry. This is a frustratingly manual process. 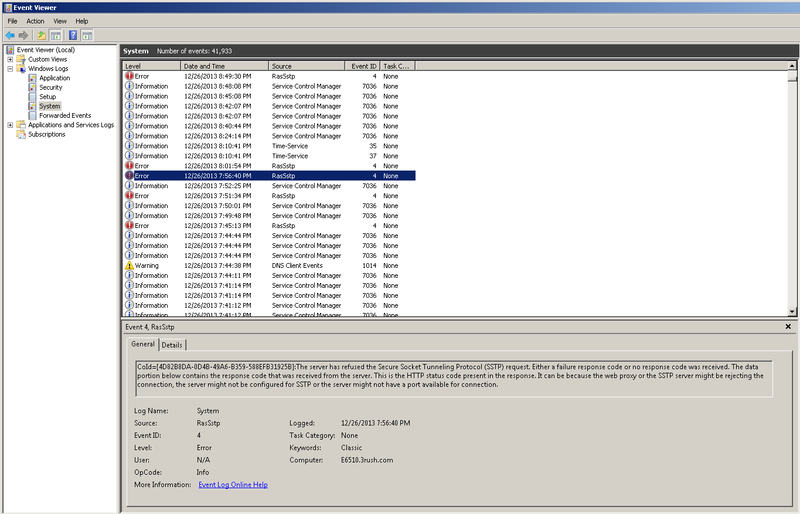 You cannot find the SHA256 hash easily (required to register it to TMG and required for Windows Vista clients and higher). This is a pseudo chicken and egg issue. There are many hours (40+) that went into mr resolution which will take you about 10 minutes to fix once you know what’s specifically wrong and what specifically to fix. 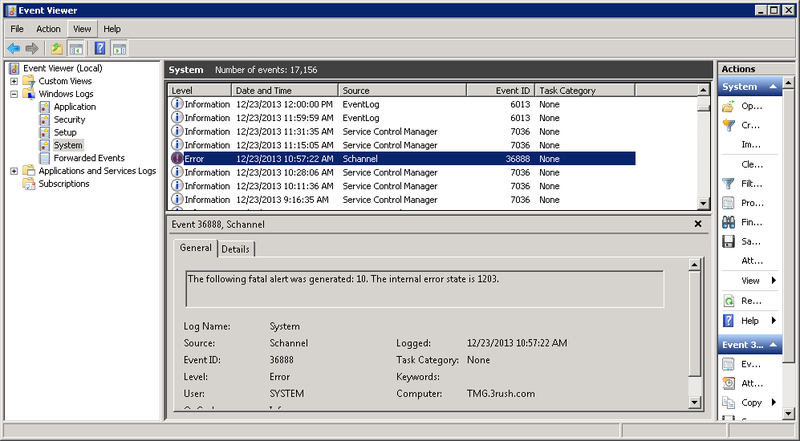 The event logs are of no help in problem definition. They will help right near the very end though in terms of figuring out the SHA256 hash. I started getting Event ID Error 4 on the client and also received an error message from the SSTP dialog box when trying to VPN in. I also got a bunch of RasSstp errors Event ID 18 as well as Event ID 36886 Schannel errors which basically mean that your certificate doesn’t work and/or is not properly registered or just isn’t installed. THIS IS THE CRUX OF THE PROBLEM. On the File menu, click Add/Remove Snap-in. 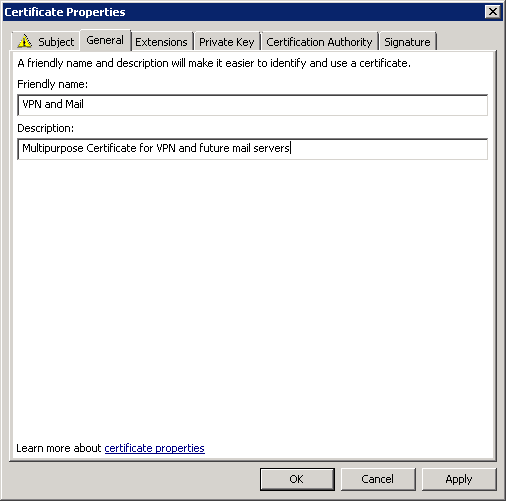 In the list of available snap-ins, click Certificates, and then click Add. Click Local computer, and click Finish. 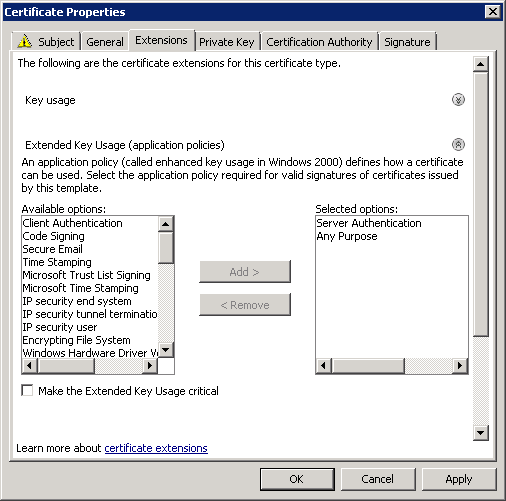 In the console tree, double-click Certificates (Local Computer), and then double-click Personal. 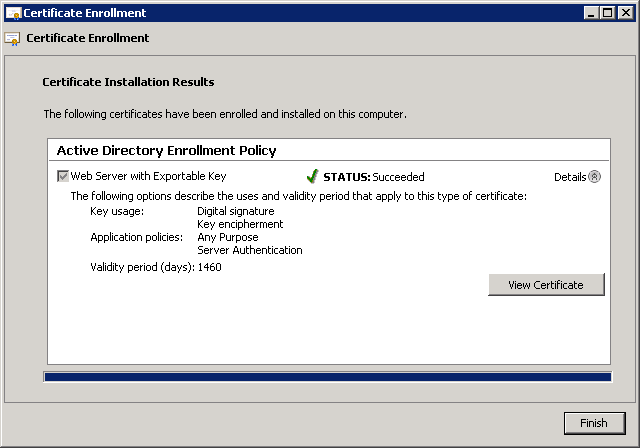 Right-click Personal, point to All Tasks, and then click Request New Certificate to start the Certificate Enrollment wizard. Select the Web Server template or custom template you may have created like I have. Click the warning icon below More information is required to enroll for this certificate. 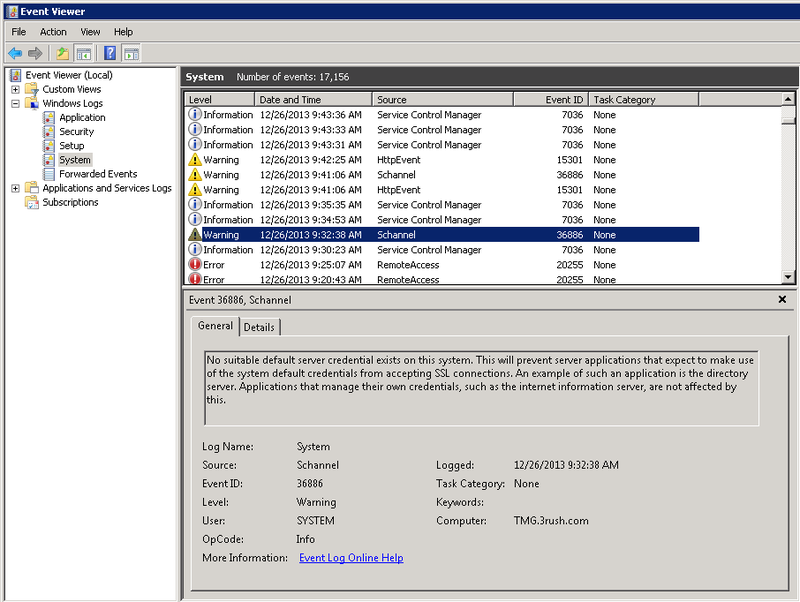 Click here to configure these settings. In the Subject name area under Type, click Common Name. In the Subject name area under Value, enter the fully qualified domain name of the server, and then click Add. (This is important to choose the name your VPN client will connect to externally. Whether it’s VPN.domain.com or something else. This is also the place to add other alternate DNS names. Please see my screenshot for details. In the Alternative name area under Type, click DNS. In the Alternative name area under Value, enter the fully qualified domain name of the server, and then click Add. Repeat steps 17 and 18 above for each additional SAN that you require. Click OK when finished. I added a friendly name and description as well as validating the following selections were chosen in the print screens. Remember The private key must be exportable. To specify that the private key is exportable, click the Private Key tab, click the Key Options arrow, and click Make private key exportable. The CA must also be configured to support exportable private keys. Click “View Certificate”, Details and scroll down to Thumbprint. That thumbprint will be of critical importance to this process. Now, we’ll want to export this key and install it on our client (in the Computer\Personal store) that we’ll be using to test connectivity with. 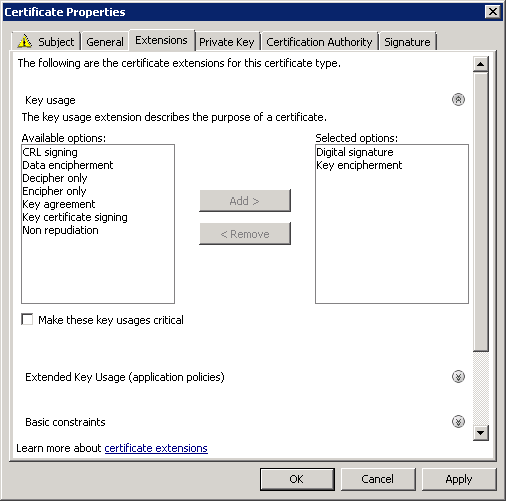 Open the MMC for certificates –> Computer and make sure the key is in the Personal>Certificates folder for the Local Computer account. 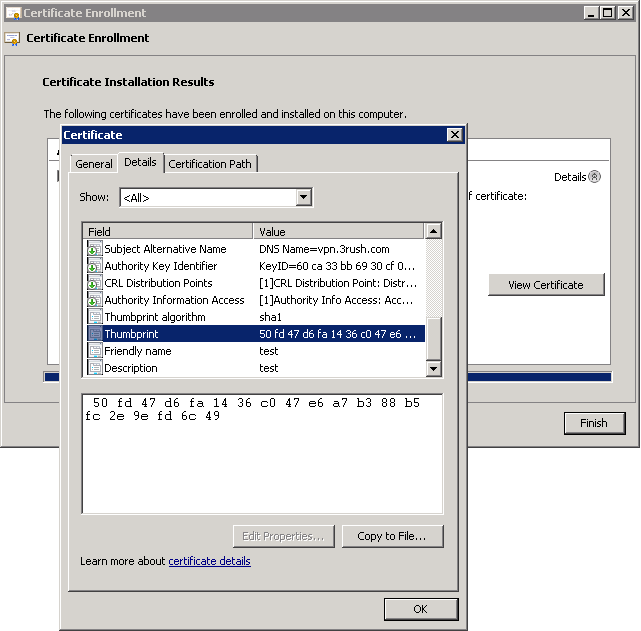 Alternatively, you can open the Certificates snapin for the Local Computer account and choose “import”, find the file and go through the above steps. Please go on to part 3 of Nightmare on VPN street with TMG and SSTP.